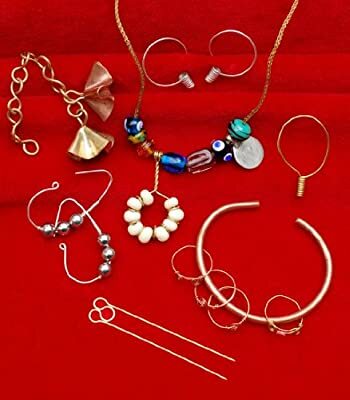 This book will show you how to make jewelry designs that have been around for over 1000 years - timeless items that are still beautiful today. Photographs of artifacts that I own, along with detailed measurements of them are included in this book. 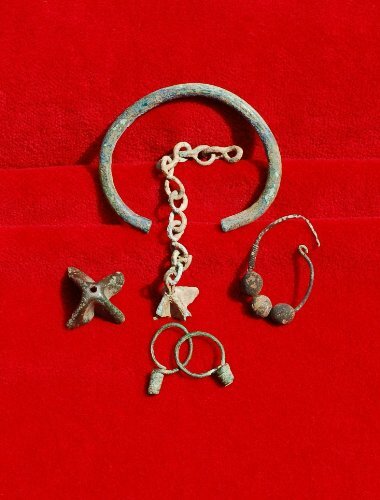 I hope this will help those wishing to recreate historical jewelry. No heat or flame is required for any of these designs and most of the tools are portable. Pieces include: Beaded oval earrings from the Viking culture, Coiled end earrings from Luristan, Iran 1000 BC and the Viking culture, Double spiral ring from the Etruscan, the Celt, the Roman, the Saxon and the Viking cultures, Knot ring from the Viking culture, C bracelet from the Sumarian, the Germanic, the Celtic, the British, the Roman, the Turkish, and the Scottish civilizations (beginning about 2100 BC), S Link chain and folded dangles from the Viking culture, Glass bead pendant from the Viking culture, Triple loop pin from the Macedonian culture. 94 pages - 164 Black and White illustrations The designs presented in Ancient Wire II are created using different methods than those taught in my first book, Ancient Wire.